Disaster risk reduction actions taken by the health sector risk should be evaluated in order to monitor progress and make necessary adjustments in all the phases and stages of the disaster risk management process. Countries that have mechanisms to evaluate the performance of their plans and programs are in a better position to ascertain the health sector’s capacity to fulfill its duties and responsibilities in an emergency or disaster. 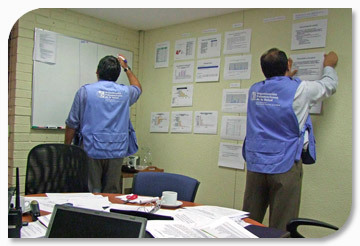 The most important way of evaluating the progress of plans and programs for disaster reduction in health is to establish objectives, expected results, and indicators beforehand. The design and use of the measuring instrument will make it possible to generate periodic progress reports, identify components that need to be improved, and implement the corresponding adjustments. The countries of the Caribbean have developed and are using an excellent instrument for self-evaluation of disaster reduction in the health sector. Although the evaluation is qualitative and will need modifications in the future, it is currently the best tool available to obtain a quick and low-cost snapshot of the sector’s progress in reducing risks and its capacity to address the impact of disasters.